Nobody plans or budgets for a divorce. The most economical way to get divorced is to agree to the terms. 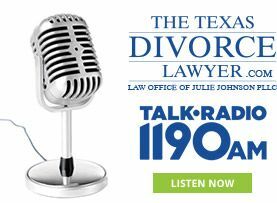 The term “uncontested divorce” is misleading because it doesn’t mean that both spouses agree to get divorced. It means that both spouses agree to all the required terms for their divorce decree. a parenting plan, which includes the possession and access schedule then the divorce process can be must faster and more economical. If you and your spouse have not reached an agreement, but think that reaching one is possible, we can provide advice, facilitate communication and guide you toward reaching a fair settlement. Even if your divorce is not agreed to in the beginning, it does not mean that an agreement won’t be reached. Most of our clients reach an agreement during the divorce process. When and how they reach an agreement differs from case to case — and depends on the parties involved. We’ve helped hundreds of couples through the process of divorce. At Julie Johnson Law, we pride ourselves on giving you not only the best rates, but also include every service that you need to get things done correctly, privately and quickly. To discuss your case and receive a full evaluation of your circumstances, contact our office at 214-265-7630.